Reality Measurements is a leader in the 3D precision measurement field earning a reputation for producing the highest accurate and reliable information. Our unrivalled services paired with our state of the art technology offers clients the best information for all scanning needs. 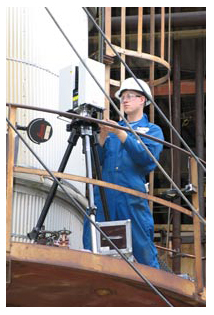 We also offer the latest in laser tracking technologies for those clients in need of extremely high accurate jobs. As a leader in the 3D measurement industry we place a great amount of focus and resources on adding value to the workflows of our clients. From the very beginning to the very end of a project, we are here to assist in any way needed to produce the most optimal deliverable end-product that can be achieved. Reality Measurements continues to grow each employee by giving them access to the best training and developmental strategies offered on the market to ensure continued development in this high-tech field. We maintain the necessary internal skillset required to meet the needs of all our clients today as well as preparing for the requirements of tomorrow. If you would like a career that will continually push you to develop the necessary skills to remain ahead in this industry, Reality Measurements is the team to join.